The Mission of the Quick Silver Flight Team is to honor and pay tribute to the thousands of veterans that have sacrificed their lives for the freedom and security of others. It is the mission of the Flight Team to keep Quick Silver in the air and Flying at as many shows as we can make. It takes thousands of hours and a large amounts of money to keep Quick Silver in the air and among her fans where they can actually see, touch and perhaps sit in a museum piece of our history. 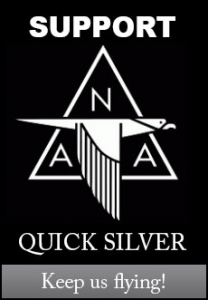 Your donations will help keep Quick Silver in the Air. Your donations go to the care and feeding of this magnificent aircraft and to help defray the heavy financial burden that the team is currently funding privately. Show your colors as a true leader of Fighter Pilots, The Squadron Commander makes sure the planes are flying and in tip top shape, crews are happy and the mission is running smoothly. Your donation as a Squadron leader will keep us flying and the dream alive. Step up and Keep Us Flying! As Flight Leader you are on the front lines and in the fight, Your making sure the mission is successful and your flight gets to fly another day. Your support as a Flight leader is walking the walk. Make you contribution today and Keep em Flying! Your the trusted Wing Man. With out you no fighter pilot is at %100. It takes your support to make sure the mission is secure and that your wing man can do his job. Support at the Wing Man level and keep Scooter flying! Without the Crew Chief, nobody fly’s. You are the backbone of the squadron, you keep the machines in the air and everything running smoothly. Donate today as a Crew Chief and Keep the dream alive and Quick Silver flying!